Introduction: The first laparoscopic donor nephrectomy (LDN) was performed in 1996. Since that time, LDN is becoming standard of care for organ procurement. Donor and recipient outcomes have been proven equivocal for laparoscopic and open nephrectomy. In the past, LDN was avoided when procuring the right kidney or organs with multiple arteries. Reviewing our experience with LDN, we compare single versus multiple arteries and right versus left organ procurement, demonstrating the safety and effectiveness of LDN in approaching these cases. Methods: We performed a retrospective review of all LDN’s at a single institution between August 2000 and August 2007. Data collected included patient demographics, estimated blood loss (EBL), need for blood transfusion, total operative time (OT), warm ischemia time, length of stay (LOS), and delayed graft function. Arterial supply was assessed preoperatively via renal arteriogram or CT angiography. Outcomes for multiple artery LDN were compared to single artery LDN; left versus right LDN were also compared. Student’s t-test and Chi-square test were used for statistical comparison. Results: Two hundred eighteen LDN’s were performed during the study period. Multiple arteries supplied the organ procured in 34 donors. The right kidney was procured in 36 LDN’s. No significant difference in EBL, need for transfusion, OT, or LOS was noted for multiple versus single or right versus left LDN. Warm ischemia time was significantly higher with multiple arteries (mean= 81.7 seconds) compared to single arteries (mean= 63.2 seconds) p = 0.0003, and for right (mean=85.9 seconds) compared to left (mean=62.3 sec) p = 0.0001, LDN. However, this did not translate into a significant difference in allograft function for either group with 16.7% of multiple versus 7% of single artery organs showing delayed graft function (p = 0.182) and 13.6% of right versus l7.4% of left kidneys showing delayed graft function (p = 0.395). Conclusions: Presence of multiple arteries or need to procure the right kidney does not affect operative outcome of laparoscopic donor nephrectomy. While warm ischemia time may be higher for these select groups, this does not result in delayed allograft function. 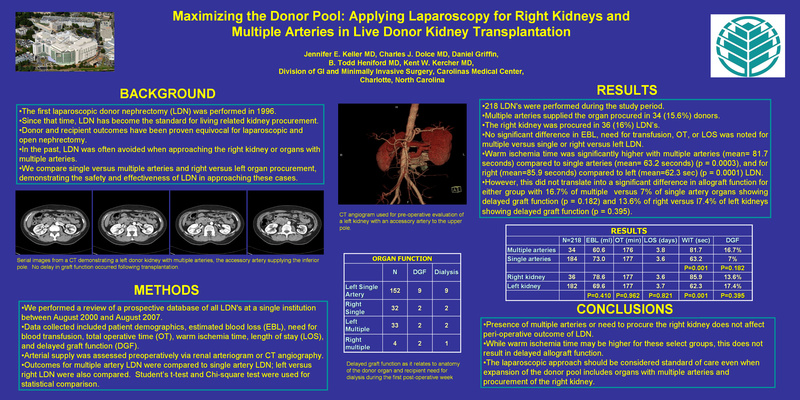 The laparoscopic approach should be considered standard of care even when expansion of the donor pool includes organs with multiple arteries and procurement of the right kidney.